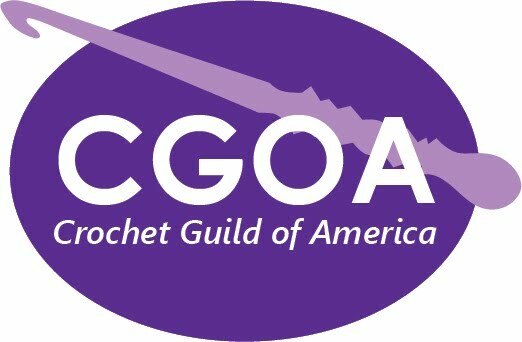 Please visit the CGOA website to see the new HD videos by Kim Guzman in a new Learn to Crochet series. Right- and left-handed versions available. Here is the first of the series. Please visit here to see the entire series. And, stay tuned! There will be more! Congratulations to Donna Wolfe, of Scranton, Pennsylvania, whose winning logo design will be used throughout the 2014 celebration of the 20th Anniversary of CGOA! Many, many thanks to Crochetville who sponsored the $250.00 prize that Donna won. Register now for the first annual Heroes for Hope 5K Run/Walk benefiting Bow Dazzling and St. Jude. The proceeds raised from this event will enable Bow Dazzling to expand our delivery area and to make a special trip to St. Jude in December! We hope you can join us for this fun event! PLEASE SHARE this event with your friends, family, co-workers and any other groups that you are with! The Trinity Trails at E. 4th St. and Sylvania Ave.
· Free Beer! (with ID) Free Massages! Thank you, Lion Brand Yarn, for sponsoring the CGOA Professional Development Day in Indianapolis! It was a fun and educational day thanks to our many fabulous presenters! Bobbie Matela speaking on editor critique. Melissa Leapman presenting how to create a proposal. Kimberly McAlindin our emcee for the day. Amy Shelton discusses social media. Walking into the room was like walking in to a candy store! Lion Brand Yarn donated all the hooks and yarn for our attendees to make squares for “Warm Up America”! The tables were centered with all different colors and collections to choose from! “Warm Up America" provided several different patterns to work on - lots of fun deciding what to do first! Our Attendees really knocked out a lot of squares for a great cause! A very big thank you for all the great raffle prizes that were donated! Karen Ratto-Whooley, Pamela Price Designs, Ellen K. Gormley, Coats & Clark/Red Heart Yarn, Margaret Hubert, Susan Lowman, Random House/Doris Chan, Crochet 1-2-3/Value-Publishing, Caron Yarn, Universal Yarns and Tahki Stacy Charles all donated to help raise funds for “Warm Up America”! We collected $486 in raffle sales! Thank you! Most of all we would like to thank those who attended Professional Development Day! Without your attendance there would be no Professional Development Day! You don't need to be a professional to attend our event - it is for the everyday crocheter or knitter who is considering/dreaming about entering the profession - whether you are thinking about designing, contract crocheting/knitting or tech editing. It's not too late to sign up for our October Professional Development Day in Concord, NC! We hope to see you there! The Tunisian Crochet Stitch Guide by Kim Guzman is a pattern booklet featuring 61 Tunisian crochet stitch patterns. The booklet begins with an introduction to reading international stitch symbols and understanding “multiples” in stitch patterns. This introduction is followed by 14 basic stitch patterns, including common names in US terminology. The remaining stitches are organized into three sections: Typical Stitches (17 stitch patterns including classics like the moss stitch and column variations), Color Stitches (11 stitch patterns), and Lace Stitches (18 stitch patterns). Each pattern includes a swatch photo and a large, clear pattern in stitch symbols. The booklet ends with a pattern for a scarf, which is written in both pattern abbreviations and symbols, and a general instructions section that explains the basic Tunisian crochet stitches with descriptions and process photos. The Tunisian Crochet Stitch Guide is one of the new Leisure Arts booklets and is about the size of a piece of letter paper folded in half. The small size makes the booklet more portable, but the downside is that some of the swatch pictures are not very large. There are no difficulty levels indicated. 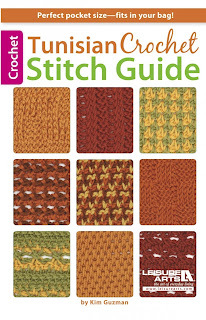 The book emphasizes international stitch symbols, so crocheters who prefer written patterns will have to adapt. (On the plus side, learning to read these symbols opens up literally a world of new patterns!) Although the booklet is limited to Tunisian crochet stitches, there is an interesting variety of fabric densities and styles. I would recommend this booklet to crocheters who are beginning to explore Tunisian crochet, experienced Tunisian crocheters who are looking for a definitive US stitch guide, and those who are budding designers. 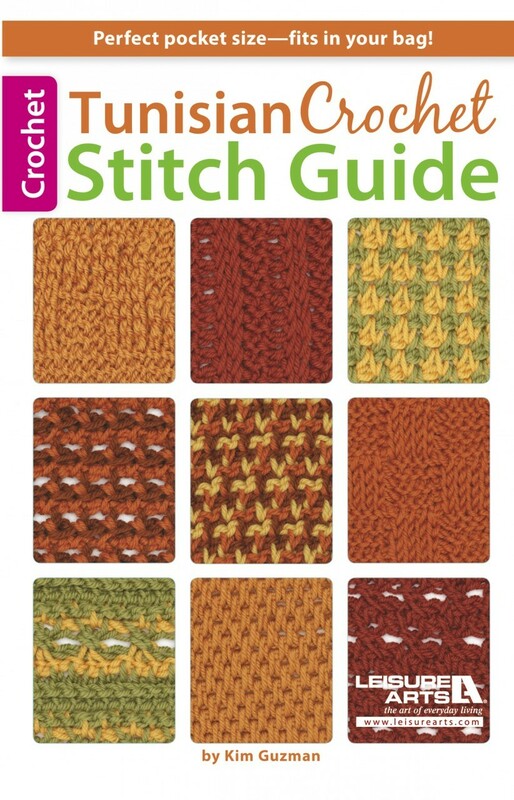 Even crocheters with a substantial collection of Tunisian crochet stitch guides will find new stitch patterns in this booklet. Full disclosure: A free review copy of Tunisian Crochet Stitch Guide was provided by Leisure Arts. Although I accept free products for review, I do not accept additional compensation, nor do I guarantee a positive review. My reviews are based entirely on my honest opinions. Doris Chan has done it again! The origin of the customizable designs in Chan’s latest offering begins with an original doily titled, “Entropy”. From here, Chan takes us on a journey, during which she incorporates elements of “Entropy” to create varied and multi-sided motifs. From there, she demonstrates how to incorporate the motifs into convertible garments, such as a poncho/skirt, shawl/throw and a long rectangular wrap that is styled four ways. In Chan’s trademark “exploded lace”, there are projects fit for every level of experience. There is a project count of 20, plus add-on flutter sleeves for the tops. Chan gives a breakdown of her design process as well, and encourages the reader to experiment with the motifs to form his or her own unique designs. Convertible Crochet deserves a place on every crocheter’s bookshelf. And since everything in this book is lace, all of the designs are great take-along warm weather projects. Full disclosure: A free review copy of Convertible Crochet was provided by Potter Craft. Although I accept free products for review, I do not accept additional compensation, nor do I guarantee a positive review. My reviews are based entirely on my honest opinions. 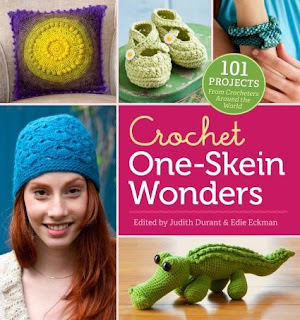 From Storey Publishing and its ever-popular One Skein Wonders series, comes the fifth volume, devoted entirely to crochet! While previous volumes have included some crochet projects, they have been composed mainly of knit patterns. Like its predecessors, this volume includes 101 projects, which are categorized by yarn weight. The breakdown goes like this: 8 thread projects, 4 projects in lace weight, 20 in Super-Fine weight, 9 in Fine Weight, 12 in Light Weight, 38 in Medium Weight and 10 in Bulky Weight yarn. The designers are names we are all familiar with; Ellen Gormley, Myra Wood, Erica Jackofsky, Edie Eckman, Bendy Carter, and more (including one pattern from yours truly)! The instructions are given in a combination of written and charted (where appropriate) format. There is a nice variety of projects represented, including jewelry, baby items, slippers, shawls, scarves, shrugs, purses/totes and several home décor items. If you are anything at all like me, there are no doubt several single skein purchases in your stash that you purchased without any specific project in mind. This book will go a long way in putting those skeins to use and assist any crocheter with their stash reduction efforts. Because the projects are all made from one skein of yarn, it also makes this a perfect summer book, since most of these projects would fit into your summer tote, so your crochet can go wherever you go! Full disclosure: A free review copy of Crochet One-Skein Wonders was provided by Storey Publishing. Although I accept free products for review, I do not accept additional compensation, nor do I guarantee a positive review. My reviews are based entirely on my honest opinions.